Slice the bitter gourd into long thin pieces. Slice the green chillies length wise. Transfer the cooked bitter gourd into a mixing bowl. Add the red chilli powder, salt, sesame seed powder and lime juice and mix well. Adjust the chillies and lemon according to your taste. Serve as a salad/side dish. 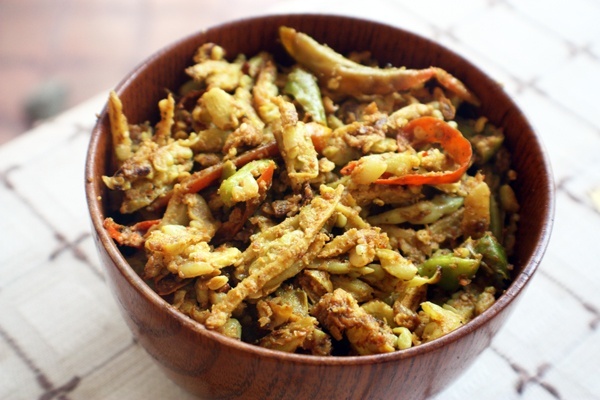 This entry was posted in Nepali Food Recipes, Pickles & Chutneys, Salads, Vegetables and tagged bitter gourd, Karela, Nepali Achar, Nepali Cuisine, Nepali Recipes by Kamakshi. Bookmark the permalink. Thanks Prapti ….. Our Nepali achar and salads are so easy to make and make a wonderful addition to any meal … Enjoy ! i gonna make this! mucho bueno! I have hunted for these recipes EVERyWHERE n finally I found whatever I was trying to look for,here. M so relieved, to have found your website. You’ve got mouthwatering, easy recipes here, which I can refer everyday. Plz keep posting new recipes.